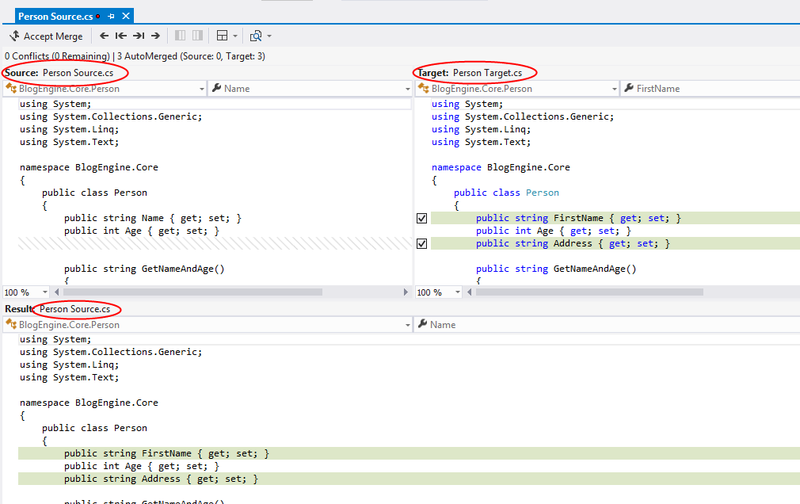 Probably you are familiar with the Diff tool that Visual Studio provides when doing Source Control. When comparing two files from Source Control Explorer or the Solution Explorer you get this nice tool that shows a nice visual compare of two files. You can choose 2 local files, a source control file and a local file, 2 source controlled files etc. Very flexible! 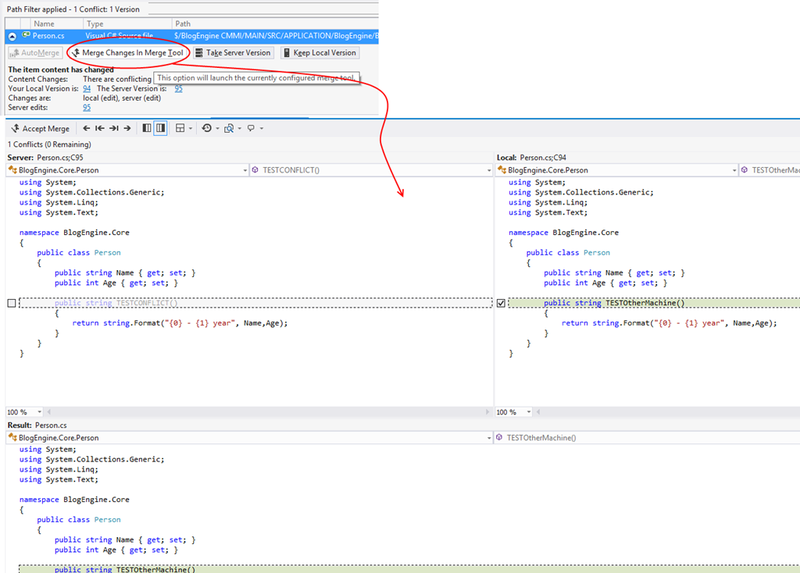 When you check in code, and have a conflict, the merge tool from Visual Studio is presented. All fine. Problem is that you need Source Control… You cannot choose compare on a file that is not under source control. So what to do when I want to use this tool for 2 local files ?? Tip: You can also use %VS110COMNTOOLS% on the commandline to point to this directory. When you start VSDiffMerge, the diff / merge tool starts up with two files that you choose. "%VS110COMNTOOLS%/../IDE/vsdiffmerge.exe" "Person Source.cs" "Person Target.cs"
starts up the IDE with “Person Source.cs” and “Person Target.cs” opened. You can also use this tool to merge 2 files. In order to do this, you need to provide the name of the file that serves as base file, and you need to specify the name of the result file. This does not seem to work with Visual Studio 2012. I keep getting Invalid command line arguments. It appears that it wants two more arguments, but I do not know what they should be. Strange, can you send the command you are using? Note that I am not certain that these arguments are actually correct, but it seemed to give the best result in my tests. Thanks, I was able to use the VS merge tool with TortoiseSVN ! Thanks, very useful! Just a tiny obvious tip: if you are using VS developer command prompt you don’t have to specify path to vsDiffMerge. Merge Changes in Merge Tool. When you choose this action, the Merge window appears. I want do it programmatically. Maybe you can invoke the command line tf merge tool and use noprompt? What’s differences vsDiffMerge.exe and tf.exe merge tools? 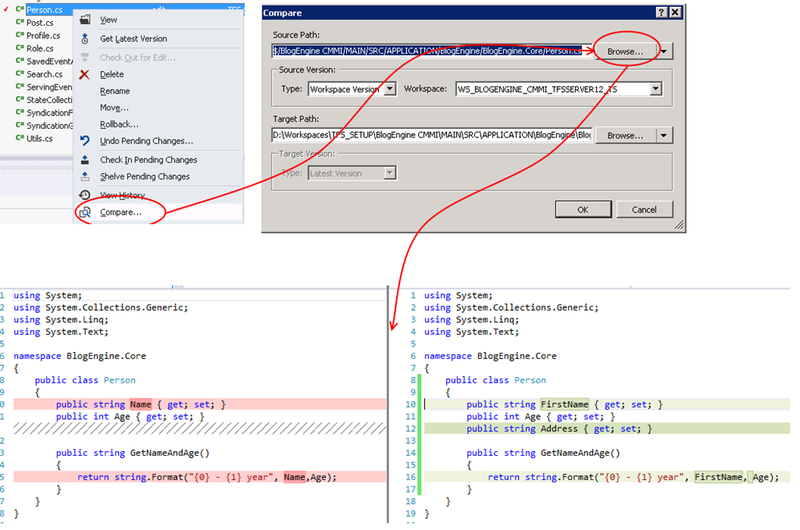 I use vsDiffMerge.exe and now shows tools in tab VS 2012. Using /t parameter or not is the same for me. How can I get “exit codes” for vsDiffMerge.exe for get results (if user accept merge or not, etc ) ? The sweet thing is, you get auto-complete for specifying the file paths! What’s is Tools class? Namespace ? assembly ?